Super Easy Roasted Veggie Salad! I made this roasted veggie salad, the other day, for lunch, and I’ve been obsessing over it ever since, because it was just so damn delicious! It’s funny how you have a clear image in your head, of how you want a dish to turn out, but then, when you start cooking, you add an extra crunch here, some spice there, and end up with something completely different from what you had imagined. Well, that’s exactly what happened with this roasted veggie salad. And let me say, I’m glad it did. So, enough of my rambling, and let’s roast us up some lunch. Peel, and cut the sweet potato in half, then into roughly 4 inch (10 cm) long wedges. Peel, and cut the onion in half, and then into long strips, and add them both into a pyrex tray. Next, cut the eggplant in half, then into roughly 4 inch (10cm) long wedges. Add it to the tray, along with the olive oil, maple syrup, chili flakes, sea salt and black pepper to taste, then give all that goodness a quick mix. Pop the tray into the oven to bake, until the eggplants are golden brown. When they’re ready, take them out of the oven to slightly cool down. In the meantime, heat a sauce pan on medium heat, then add the almond flakes, and toss the pan, until they start to slightly color. Transfer to a serving bowl. 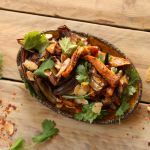 Add the roasted veggies into your serving bowl, gently mix, then garnish with the fresh coriander leaves, and your roasted veggie salad is ready to devour! How easy was that? 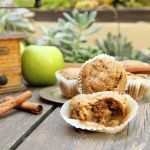 But what about some of these Apple Cinnamon Muffins for dessert? They’re moist, juicy, and 100% vegan. ← No Bake Matcha Slice Bars With Pistachios! Funnily enough I’ve been roasting a lot of veggies too. To add to pasta and bakes. Now I must do a salad next after seeing this. That sounds totally delicious. 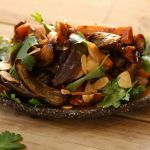 You can’t go wrong with roasted veg. As for coriander – I’ll never understand why people don’t like it!!! I like roasted, I like veggies, I like it spiced properly with some good chilies 🙂 you got me with this one! Love the photos too! 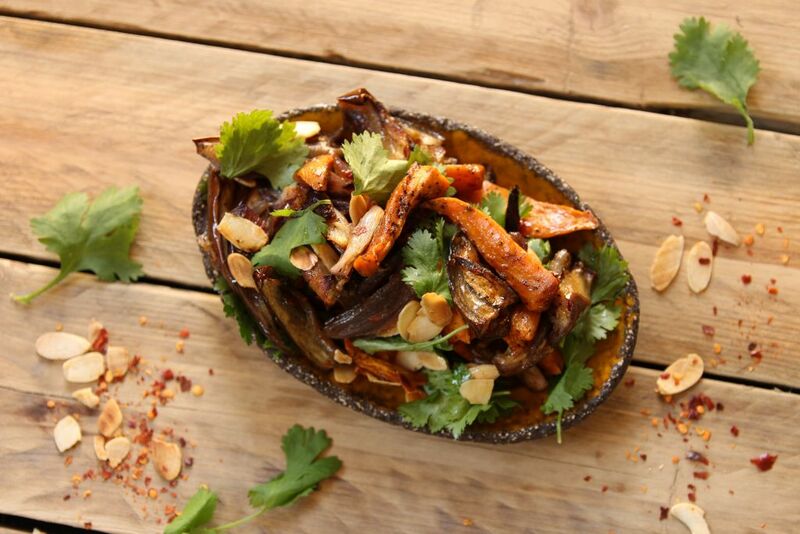 Wow this is right up my street I am obsessed with aubergines! Your blog is beautiful!